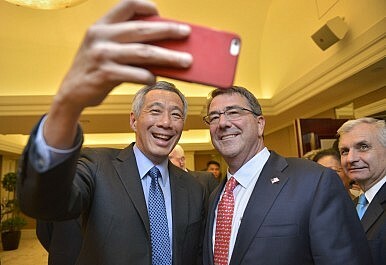 The Prime Minister of Singapore Lee Hsien Loong and Secretary of Defense Ash Carter take a "selfie" during a reception prior the opening dinner of the Shangri-La Dialogue in Singapore. Defense secretary announces fresh move at Asia’s premier security summit. This weekend, U.S. Defense Secretary Ash Carter delivered an address at the Shangri-La Dialogue, Asia’s premier security summit held annually in Singapore. In his speech, Carter articulated the U.S. vision for a stronger regional architecture in the Asia-Pacific to address shared challenges comprising five elements: reaffirming long-standing rules and norms; strengthening regional institutions; modernizing alliances and partnerships; enhancing capacity-building; and improving connectivity. The address built on recent remarks by Carter and other U.S. defense officials on ‘the next phase’ of the U.S. rebalance to the Asia-Pacific (See: “TPP as Important As Another Aircraft Carrier: Defense Secretary”). Unsurprisingly, maritime security featured prominently in Carter’s speech. In particular, Carter said that the Department of Defense would be launching a new Southeast Asia Maritime Security initiative. He said Congress had already taken steps to authorize up to $425 million dollars for these maritime capacity-building efforts. Carter did not reveal specifics about what the new initiative would entail. But new measures will build on Washington’s already robust efforts in the maritime security domain in Southeast Asia over the past few years. As Carter noted, these include providing equipment and infrastructure support to the Vietnamese coast guard, helping the Philippines build a National Coast Watch System to improve its maritime domain awareness, and conducting sea surveillance exercises with Indonesia which recently included flight portions over the South China Sea for the first time. Carter also said in his remarks that the United States has committed to sending a new U.S Defense Advisor to the U.S. Mission to the Association of Southeast Asian Nations (ASEAN) based in Jakarta. Having new adviser based in the region, Carter argued, would improve coordination and information sharing for maritime security as well as humanitarian and disaster response. More broadly, the initiative is also another nod by Washington to the increasing importance of multilateralism in the defense dimension. The South China Sea also featured prominently in Carter’s speech at the Shangri-La Dialogue. Carter used the opportunity to reiterate the firm, three-point articulation of U.S. policy that he had first announced in Hawaii a few days earlier (See: “The Case for a Bolder US South China Sea Policy”). First, Carter said the United States wanted a peaceful resolution of all disputes, an immediate and lasting halt to land reclamation by any claimant, and no further militarization of disputed features. Second, he emphasized that the United States will fly, sail and operate wherever international law allows – a reference to recent confrontations between Washington and Beijing over freedom of navigation (See: “How Would the US Challenge China in the South China Sea?”). Third and finally, he noted bluntly that China’s actions in the South China Sea were out of step with international norms and a regional consensus in favor of a non-coercive approach (See: “Does ASEAN Have a South China Sea Position?”). In the question and answer session following Carter’s remarks, Senior Colonel Zhou Bo from China’s defense ministry dismissed the defense secretary’s criticisms as “groundless and not constructive” and asked if recent U.S. actions in the South China Sea were contributing to regional peace and stability. In response, Carter staunchly defended the U.S. position, noting that China’s land reclamation activities are “unprecedented” and that it was Beijing, rather than Washington, who was changing the facts on the ground. He also reiterated that the United States would continue to fly, sail and operate in the South China Sea peacefully and lawfully as it has done for decades.